Lanyards come in many shapes, sizes and can be used in many situations. 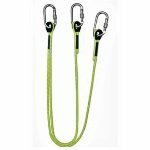 In this instance of using a lanyard on a zip wire run, it is a means of connecting components via maillons or karabiners. 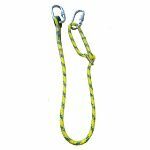 Lanyards are usually used in conjunction with the trolley, seat or harness and offer a very lightweight but secure way of combining these components. Depending on which trolley that you choose, depends on which lanyard is best suited to the trolley. 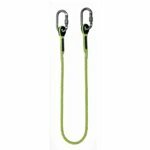 For example with the Petzl Tract Plus Trolley you can use 2 lanyards as one would be used for the connection and one would be used as a safety back up (connected from the harness or seat to the backup hole on the trolley). The idea of the backup is that if a trolley should have a catastrophic failure and fall apart, then the karabiner that is through the back up hole will fall directly onto the wire and therefore preventing any fall to the ground. It is not always possible to have a double lanyard with all the trolleys so please choose your trolley and lanyards carefully. We strongly recommend that you use lanyards that are at least, if not more than, 1.0m in length.